There is nothing more daunting than decluttering an entire home so you can learn how to live clutter free. All the closets, drawers, hidden corners, boxes, totes, under beds…let’s face it there is a lot of places where our things can gather. You long for a cleaned-out home. A place where you can live clutter free, stress-free, and chaos free. But how do you get there? How do you get from buried in a pile of mess to sitting in a room that is neat and tidy? Sure, you can block off a month or even a weekend and tackle it head-on. Lace up your shoes but on your determined face and dive into the trenches. But some of us are just not made for that type of battle. I guess that is where the old saying came from. Yep, someone that was faced with a home completely full of clutter must have come up with that baby. If we instead tackle our clutter in a slow and methodical way we just might be a bit more successful at finally removing the mess. When you are slow and intentional you not only remove the excess, but you train your mind to see your things differently. Rather than treasures you simply cannot ever EVER give away. You instead see your things as tools for helping you to live a better life. 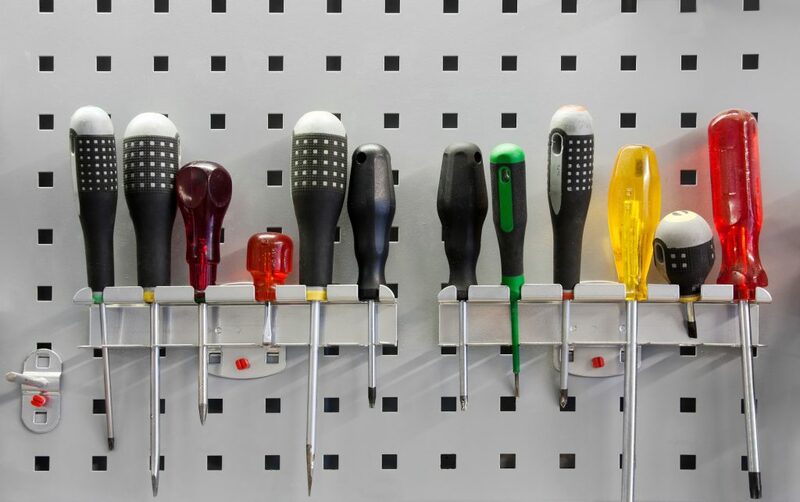 And if those tools do not achieve that goal of a better life, well then, there is just no more room in your home or your life for that matter, to hold such things. I like to call this gradual decluttering my simple trick to finally learn to live clutter free. Gradual decluttering is simply what it says. A slow and methodical way to remove the clutter and the mess from our homes. Instead of dedicating a set time block of decluttering, we are going to incorporate it into our day. When we have slow and steady decluttering we begin to evolve from a pack rat into an organized person. Something both you and I long to be! Sounds simple but how exactly do we do gradual decluttering so we can live clutter free? I am so glad you asked my soon to be reformed clutter bug. No, this first step might not be gradual, but it is super simple and incredibly effective. When we have things all over our homes, trash can camouflage our piles. When you remove the trash and the recyclables you will uncover the clutter that needs your full attention. Take 2 trash bags and just stroll around your home. 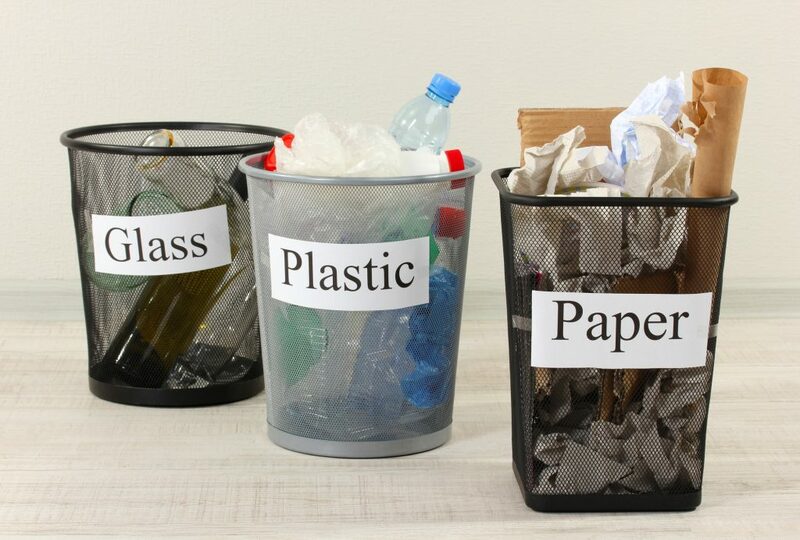 One will be for trash and the other for anything you can recycle. Be quick and be decisive. This step is meant to be thinking free. Just simply walk into a room, gather up the trash and move on. Step #2 Gather up the dishes. This is another thing that tends to migrate all over our homes disguising itself as clutter. Just like with the trash removal in step one I want you to walk around your home with a small tote and gather up all the glasses, plates and bowls. Step #3 Make room for boxes! Whenever I am decluttering anything my weapon of choice is a good old sturdy box. I LOVE boxes! And actually get excited for the UPS man to show up at my home. Because I have a steadfast rule about delivery boxes. One can never leave my home unless it is full of clutter. This one little tip has kept my home clutter-free for YEARS. For step #3 we are going to use those boxes to begin our gradual decluttering project. But first, you will need to make room. No, you can’t just toss a box into a room and be done with it. Instead, you will need to make room in a spot that screams for your attention. A spot that you simply cannot miss because it is really that obvious. I like to call this, “In site – In mind” decluttering. When you put a box out in the open you will WANT to fill it up just to get it out of the way. Trust me this really does work. 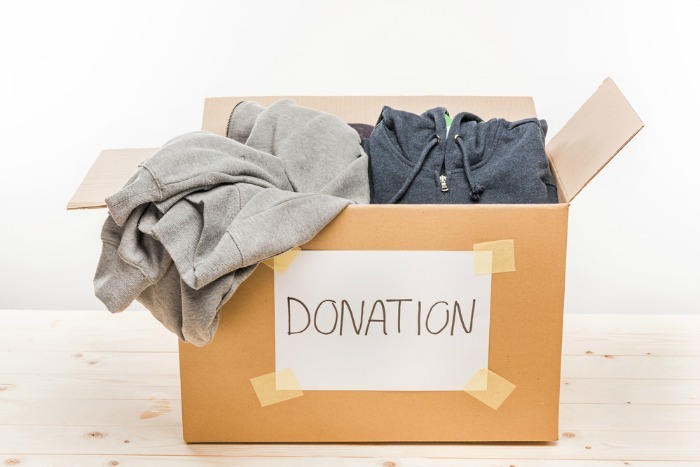 In each room where you want to declutter, find a spot to put your decluttering box. Clean off a counter, or a spot on the kitchen table, on the corner of a bed, on the coffee table, anywhere that will make the biggest impact on you and your family. Step #4 Start filling it up. You know it sounds so simple when you put it that way but that is the beauty behind this system. It’s simple so it works. As you go about your day and you come across items that you no longer need, use, or love I want you to put them into your box. Don’t make any extra effort, just make it a part of your daily habits. Not sure you understand? Let’s test drive this and see just how it works. You are getting ready in the morning for a busy day of work and commitments with the kids. As you are getting dressed you walk over to your heavily cluttered dresser. On top are an empty shoe box and a pile of ratty old undershirts from your husband. Gather them up right now and put them into the box. You go into your bathroom and open the drawer to get your brush. Inside you see not one brush but 7 of them. Pick your favorites and put the rest into the box. Now you are in the kitchen making yourself a much-needed cup of coffee. Sitting next to your favorite coffee mug is a stack of other mugs that haven’t been used in months or maybe ever. Select just a few and put them into the box. You then head over to the refrigerator to pack a salad for your lunch and see your fridge is buried under a million magnets. Pick off a few that mean little to you like the dental reminder magnet from 1997 and toss it into the box (or the trash for this example). Finally, you are ready to leave for the day and slip on your shoes. You look down and see several pairs that you no longer wear sitting in a cluttered pile. Pick those babies up and put them (you guessed it!) into the box. It so frighteningly simple yet so incredibly effective and a great way to learn to live clutter free. The key to gradual decluttering is to let things evolve at their own pace. Don’t force it or rush it unless you really want to. Gradual is the key to your decluttering sticking. Gradual is the trick behind learning to see your things differently. Gradual is the magic behind a reformed clutter bug like me. Over 10 years ago I began with a box and an incredible mess. Here I am now still with a box (and a few baskets too) and a cleaned out and streamlined home. Be patient and in time you will not only clean out the mess but remove your cluttered mentality. Step #6 Give purpose to your rooms. This, my friend, is the secret sauce behind ANY organized and clutter free space. Give your room a specific purpose. When you give your room a specific purpose you will immediately keep that room clutter free. So, for example, your bedroom is specifically meant for sleeping and dressing. The only items that are allowed in that room are those things you need to fulfill the purpose you have determined. Anything else that does not help you to fulfill the purpose of the room must leave. If it doesn’t belong, take it out and put it where it does belong. Step#7 Keep it simple and live clutter free! As you define the purpose for each room, you might notice that throughout your day you will come across items that do not belong. Rather than drop and run to return each misplaced item, instead use my all-time favorite clutter busting tip. These little gems will keep your newly decluttered rooms neat and tidy without effort. READ: ORGANIZERS FOR YOUR HOME THAT ACTUALLY WORK! Simply place a basket in each room or area of your home where items tend to gather. In your family room – Love this big old basket that fits in perfectly in the family room! 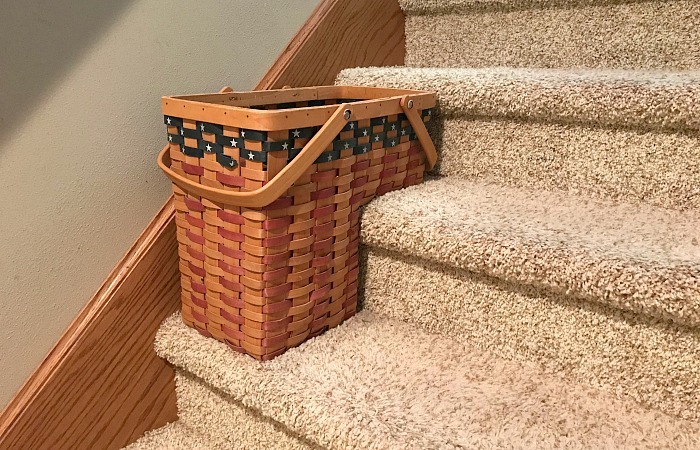 On the stairs – get my favorite stairs basket here! In the office – love this hinged basket? I do too! Get yours right here! 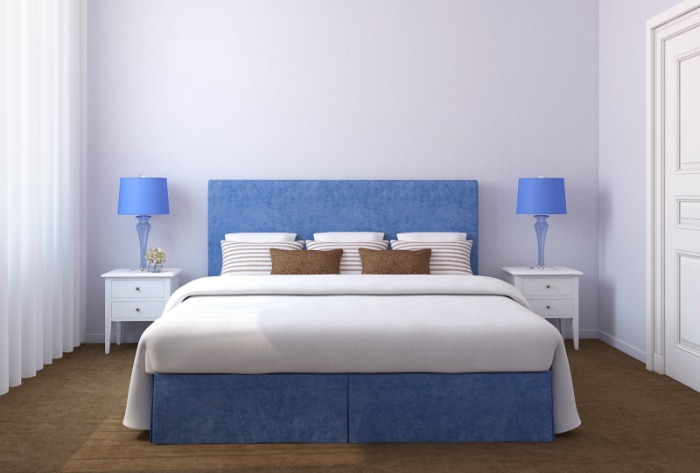 Simply choose a location that makes it easy to use and compliments your room. Remeber to always keep it simple so you use it. Complicated just doesn’t work for clutter bugs like us. Simple works, so keep it simple! As you learn gradual decluttering you will hone in on the purpose of each room. As you hone in you will remove more and more of what no longer belongs. And as you remove more you will be able to streamline and organize what is left to turn your once cluttered room into a tidy space you love to be in. 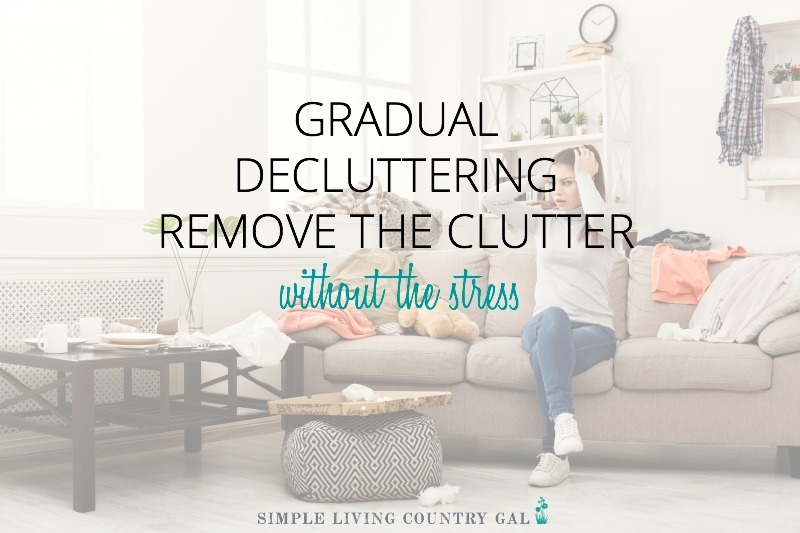 Gradual decluttering is the secret to living a stress-free life free of clutter and chaos! What things do you do to live clutter free! 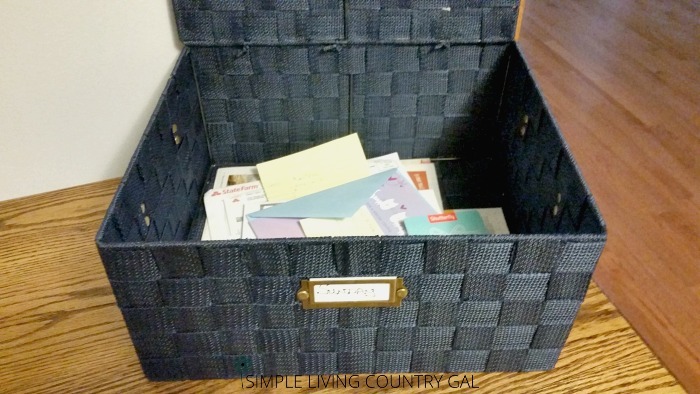 I love the idea of any box that comes in goes out with our clutter. Gonna implement this one right away. Thank you for the ideas and inspiration I so desperately need. Great tips for keeping clutter under control! Thanks for sharing on Homestead Blog Hop, we are featuring you this week! Thank you so much, Liz! I am thrilled to be featured on my very favorite blog hop!! I love the idea of clutter leaving with every box that comes in! I cannot tell you how this one simple tip has kept my home cleaned out! This comes at a perfect time because I’ve been on a rant regarding the clutter in and around my house lately. Thanks for all the tips. You are welcome Renee! We are dealing with outside clutter right now. Funny how that stuff piles up out there! I love decluttering! I spent yesterday going through my basement. Felt great! I get in a bad mood if my house is dirty or cluttered. I love the idea of a box for donations to fill. There are a couple of places that tend to get cluttered and the baskets are another great idea to help combat that! THanks for the tips! I have really been getting serious about removing clutter from my home, so I will be putting these tips to good use. I especially love what you said about only keeping items in a room that serve the rooms purpose! Thank you for all of these helpful tips!! Yay! This is motivating me. Now that the kids are back in school I am so excited to get this house in order! I always found this time of year so motivating for decluttering my house!